Gerald A. Marx, Professor of Horticultural Sciences at Cornell Uni­versity, New York State Agricultural Experiment Station, Geneva, NY, died in Nov. 1988 at his home in Geneva. Born in Wisconsin (1930), he received his B.S. (1952), M.S. (1956), and Ph.D. (1959) degrees in agronomy from the University of Wisconsin, Madison. Dr. Marx joined the faculty of Cornell University in 1959 and over the years established an international reputation for his work on the genetics and breeding of vegetable crops. He made significant breeding improvements for tomatoes, winter squash, carrots, and beets. However, he was best known for his work with garden peas. 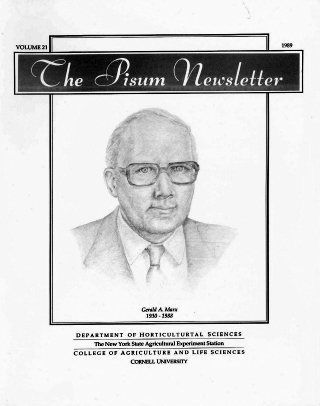 In 1969 he was instrumental in founding the Pisum Genetics Associa­tion, with the aim of fostering genetic research on the pea, facilitating exchange of information, and ensuring the preservation of valuable genetic stocks. Dr. Marx continued to play a guiding role in the affairs of the Pisum Genetics Association, serving as chairman of the Coordinating Com-mittee and editor of the Pisum Newsletter until his death. His deep and abiding interest in the pea undoubtedly helped sustain him through a long and increasingly painful illness. Dr. Marx had a keen appreciation of the value of basic research and its usefulness in solving practical problems. Developmental genetics of higher plants was one of his greatest interests. His acute powers of ob­servation and close attention to his plants enabled him to detect and note various effects and interactions which significantly increased our know­ledge of the actions and interrelationships of many developmental mutants. His two recent reviews on developmental mutants will serve as a valuable source of information for scientists working in this area. Any and all genetic variation in the garden pea was of much interest to Dr. Marx. He made extensive investigations of the inheritance and linkage relationships of. pea mutants. He developed at Geneva an immense and highly valuable dynamic collection of thoroughly documented genetic stocks of peas. He shared this valuable germplasm with researchers from all over the world and will long be remembered for his generous encouragement of students and other scientists interested in investigating the nature of gene action. Dr. Marx is survived by his wife, Mary Lou, and by a brother and several nieces and nephews in Wisconsin. Anyone wishing to make a contribution in memory of Dr. Marx is re­quested to donate to the Pisum Genetics Assn., in care of F. Van Kirk, Dept . of Horticultural Sciences, NYS Agricultural Experiment Station, Geneva, NY 14456, USA. PURPLE AND YELLOW PODDED LINES OF PISUM SATIVUM L.
SELECTION IN VITRO FOR ATRAZINE RESISTANCE IN PISUM SATIVUM L.
WITH TWO Agrobacterium tumefaciens STRAINS. ASSIGNMENT OF LINKAGE SEGMENTS TO CHROMOSOMES 3, 4, 5 AND 7. LOTS OF PEAS WITH SYMPTOMS SIMILAR TO THOSE DESCRIBED FOR PSbMV. PEA LEAF ARCHITECTURE: THE INTERACTION OF af, tl AND tac. WAXLESS POD (wp) SHOWS LINKAGE ON CHROMOSOME 6. A-2: A NEW LOCUS CONTROLLING ANTHOCYANIN PRODUCTION IN PISUM. AND sn- ON A lf E Dne BACKGROUND. LONGEVITY OF PEA SEED IN STORAGE AT HOBART. ALLELISM TESTS ON LINES WITH THE ERECTOIDES PHENOTYPE. GENOTYPE Le lv: AN EXTREMELY LONG INTERNODE LENGTH TYPE. SURFACE SPREAD SYNAPTONEMAL COMPLEXES IN PISUM SATIVUM. AND SEED ALBUMIN K9 GENES. TRYPSIN INHIBITOR GENES ARE LINKED TO R AND Tl. PEAS WITH FUSARIUM OXYSPORUM f. sp. PISI. THE GENE lk (ERECTOIDES) ON CHROMOSOME 5. NEW GENE CRISPOID (crd) ON CHROMOSOME 1. A NEW GENE HETEROPHYLUS (het) ON CHROMOSOME 7. IN CALLUS CULTURES AND REGENERATED PLANTS OF PEA. OBSERVATION OF LINKAGE BETWEEN rui AND LOCI ON CHROMOSOME 6. BREEDING PEAS FOR RESISTANCE TO SOIL-BORNE DISEASES. DRY PEA PRODUCTION AND RESEARCH IN BRAZIL. The Af-I-Aero-"Ch" GENE SYSTEM AND ITS USE AS A TEACHING AID.